Microsoft Surface Go is compact, lightweight and perfect for on-the-go work. The Surface Go comes with USB Type-C port but lacks LTE connectivity. It offers sturdy design but the battery life needs some attention. Microsoft and Intel defined what a modern computer should look like when they announced the idea of a netbook in 2007. The netbooks were evolutionary because it gave importance to portability ahead of everything and it was so promising that all Windows OEMs decided to throw their hat. However, what they didn’t know back then was the fact that netbooks are set to bomb big time in the market. As soon as the first batch of netbooks started reaching consumers, the overwhelming majority was that they are just cheaper computers with performance that was underwhelming when pushed to their limits. In real life, that isn’t the only reason for its failure. Netbooks were actually too ahead of their time, a time when portability was not valued that much. Fast forward a decade, you are looking at an era where portability makes or breaks a product. Since the launch of iPhone in 2007 and the onslaught of Android smartphones across price segments thereafter, the first computer most people got is their mobile. Today, a smartphone is used for everything from browsing the web, looking for driving directions, messaging friends and even getting work done in certain cases. They are successful because they are portable and now, netbooks are trying a second stint where they once again project portability as the biggest benefit. Microsoft Surface Go is the first product in this attempt to reinvent netbooks for modern users. The Surface Go can be easily dismissed as a lighter version of the Surface Pro, which is exactly what netbooks were, a lighter version of proper PC but only difference being that it is not called a netbook. So, is Microsoft Surface Go any better than netbooks from the past decade? Is it a tablet or a PC? Does it work as a PC? Can you get work done with it? There are a lot of questions and I tried to find answers to all these very questions during the week spent with Surface Go as my only computer. In the tech world, the reference to “Honey, I shrunk the kids” is more relevant with the Surface Go than any other product. It appears as if Microsoft designers took the Surface Pro, and shrunk it till it reached a screen size of 10-inches diagonally. Then, to add a bit of character, Microsoft gave it rounded edges and set the ports in such a way that you cannot see them immediately. Look past this, and you’d realize that the Surface Go is like any other Surface in the market. It comes with a premium build that, while not ruggedized, but offers solid construction that can withstand few bumps along the way. It comes in the standard Surface grey finish and has a kickstand that remains its unique selling point despite Windows OEMs copying for it several years now. On the Surface Go, the kickstand can go 165-degrees and due to its smaller size, it feels as if the device has gone completely flat. The rounded corners come into play when you hold the Surface Go in tablet mode. The feel of holding this 10-inch tablet, mind you it is dimensionally bigger because of those bezels around the display, is pleasing and the 500 grams weight makes it comfortable to hold that way for longer duration. Yes, I streamed movies on this, in tablet mode, and I have no complaints, whatsoever. At the front, there is a 10-inch PixelSense display with a resolution of 1800 x 1200 pixels and 3:2 aspect ratio. I must add the display is not as good as the one on the Surface Laptop or the Surface Book 2, but it would be fine for most users. I streamed a couple of TV shows and the display didn’t giveaway the fact that it is of lower resolution with adequate details and decent viewing angles. However, it could have been brighter when viewed under direct sunlight. Every time I saw something on the screen with sunlight falling on it, I kept pushing the brightness button higher. The best part of this display, however, is the fact that Microsoft sticks to a 3:2 aspect ratio regardless of form factor and size and this allows for better split screen multitasking. I could keep four windows open at the same time even though the display is tiny. A 4:3 aspect ratio adopted by iPad can only let you have two active screens at a time for multitasking while a third window can be dragged in but is limited to certain apps. If you are a power user, one who constantly juggles between programs, applications and browser tabs, then it would be much smoother on the Surface Go than on an iPad. While Surface Go is a shrunken down version of the Surface Pro, it does offer a USB Type-C port. I think a laptop or a tablet without a USB Type-C port will become extinct sooner and it is good to see Microsoft not killing the product on its arrival. Overall, Microsoft has made it clear what a modern and compact computing device should look like and it would be interesting to see how its OEM partners outdo the software giant. Microsoft Surface Go’s most controversial part is the hardware. It is built really well but what’s inside could put off people who take hardware components seriously. Powering the Surface Go is an Intel Pentium Gold 4415Y, a dual core processor with four threads, having a base frequency of 1.6GHz. Most people asked me why Microsoft went with this and not a seventh generation Core i3 or an 8th generation Core i5 processor. The answer lies in the fact that the 4415Y has much better thermal design power of 6W, which is critical for a form factor like this. Since it shares the same socket and architecture with the Core i3-7100U, the processor is not as bad as it is portrayed to be. While buying Surface Go, Microsoft offers two options: 4GB RAM and 64GB storage or 8GB RAM and 128GB storage. Our review unit was the latter priced at Rs 49,999 while the 4 gigs version is priced at Rs 37,999. The price is not inclusive of the Surface Type Cover keyboard or the Surface Pen. In terms of real world performance, the Surface Go surprised me, pleasantly. My day involves having number of websites open on a browser, checking Twitter, listening to podcast via Spotify or actual source and of course, getting work done on WordPress. Let me say this, the Surface Go handled these tasks without breaking a sweat. In fact, my work laptop with a seventh generation Intel Core i5 and myriad HP software struggles handling these very applications. The one area where Surface Go struggles is photo editing and the experience is so laggy that you can rule out video editing altogether. Gaming is another area that Surface Go cannot list as its strong suit. However, if you are someone like me, who writes for a living and reads multiple websites for reference and uses a proprietary tool to publish stories through web then Surface Go is adequate. Microsoft has designed the Surface Go for those who use their smartphone as the primary computer but also need a real computer to do things like sharing huge files, inputting data and most importantly communicate with their colleagues through tools designed for such use. In all such cases, the Surface Go actually outperforms and if that’s all you do on your computer then you might not really be disappointed. Apart from performance, the Surface Go also has the versatile kickstand, which extends as much as 165 degrees. While the kickstand is useful, it is not practical for typing on your lap. If Surface Pro scores high on lappability then Surface Go scores the lowest. Every time, I tried typing something with the device on my lap, I spent next few minutes fearing it would drop. 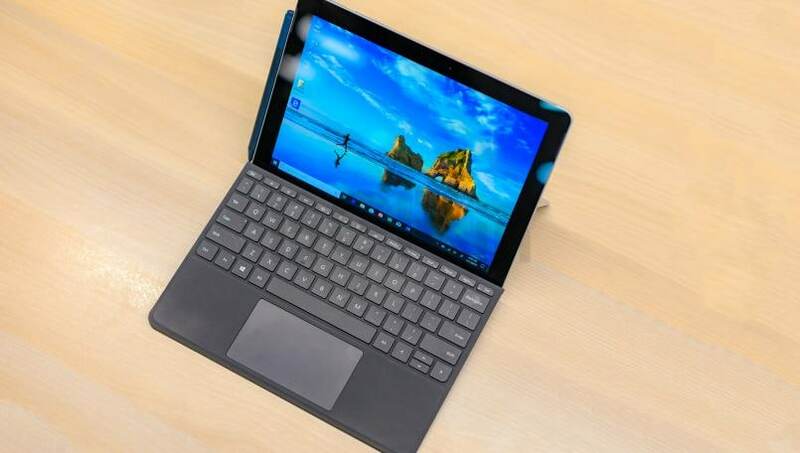 Bottomline: The Surface Go is meant to be used on a flat surface only. It also supports Windows Hello facial recognition system, which is the most convenient method to log in to a Windows based computer. It is really fast and works even in dark. It may not be as secure as Apple’s Face ID but unlike smartphones, it has little chance of being misused by thieves. The wireless connectivity is also really solid but nonetheless, it is a disappointment that Microsoft is not offering LTE version in India, where data connection is the cheapest around the world. As far as ports are concerned, Microsoft has not been that generous. The Surface Go only comes with Surface Connector for charging, a USB Type-C port for data transfer, a 3.5mm headphone jack and microSD card slot neatly placed under the kickstand. There is a power button and volume rocker at the top when you viewed in landscape mode and I think it is not the most ideal placement on the computing device. The Surface Go hardware is both a hit and a miss, which means the Surface Go 2 has good room for improvements. Microsoft Surface Go is a compromise in one area that can be overlooked: battery life. According to iFixit, the Surface Go comes with a 26Wh battery, which is much smaller than the 45Wh battery found on the Surface Pro and is also smaller than the 32Wh battery found on the 9.7-inch iPad. The use of smaller battery shows in real use case where the Surface Go dies faster than other Surface devices. For my work use, the Surface Go lasted just between four and four and a half hours. In comparison, the Surface Laptop was able to get me a full day of use while Surface Book 2, with its massive battery was left with some juice at the end of the workday. If you are into media then the Surface Go would ideally let you watch two movies of length around two and a half hours. Anything more would be by limiting the display to lower brightness and turning off few other activities. The battery is definitely a far cry from that of iPad Pro, which lasts several hours but that’s another reason why the Surface Go is a laptop first and tablet later. As I mentioned before, I write for a living and a keyboard is the most vital element to type anything, including this review. The Surface Go, like other Surface detachables, supports Microsoft’s Surface Type Cover keyboard, which is sold separately for Rs 8,699. Honestly, I struggled to type on this keyboard at first since I am accustomed to typing on keyboards with larger surface area but my flow improved on the very second day. Yes, I got as good as I would be on a standard keyboard when it comes to typing but the accuracy was sub par. Since the material is standard plastic and not alcantara like the Surface Pro or Surface Laptop, the palm rest is not luxurious. If you type a lot then you should simply buy the tablet and then separately order any of Logitech’s excellent Bluetooth keyboards. I would also recommend checking out Surface Keyboard or Microsoft Ergonomic Keyboard for superior typing experience. The trackpad on the Surface Go is also something that you can use but is not any better. For one, the trackpad is much smaller than it should have been. While it recognizes Windows 10 gestures and enables smooth scrolling, it does seem cramped in that space. With Apple making the trackpad ever bigger on its MacBook lineup, I was left wanting for more. Sometimes I wonder if OEMs are purposely doing this to sell external mice with their computers. The Surface Go would work for most users without any issue but the deal breaker would be its software. Out of the box, the Surface Go runs Windows 10 Home in S mode. In other words, it is using the Windows 10 S and not regular version. The S mode restricts Windows from installing .exe files, which is the most effective way to install programs on Windows and instead forces users to only use trusted applications from Windows Store. So, if you want to use Google Chrome instead of Microsoft Edge as your default web browser then you will need to move to regular version, which is one time free switch. However, once you ditch the S mode, you cannot move back unless you do factory reset. The Windows 10 S mode is a clever implementation but one that is failed at its outset. The reason being that most of the frequently used apps or programs are not readily available on Windows Store. I use Spotify desktop but since it is not available through India Store, the only option is to grab the .exe version and install it. On Surface Go, I cannot do that without switching to standard Windows 10 Home. So, it would only be wise to use the Windows 10 Home in S mode and the moment you need to install something from outside Windows Store, you take the plunge and migrate to standard version. Past that hurdle, we are looking at Windows 10 Home version 1803, yeah no October update just yet. You get all the great features like Alexa integrated with Cortana, a people bar to quickly chat with your team and smoother performance. There is nothing much to complain here. If you like Windows then this is the best version of it yet. Microsoft Surface Go is not the most powerful Surface in the market. It is not the most beautiful looking one either. Its display can look washed out when placed next to the 2018 iPad Pro and does not have those ground breaking scores on benchmark that you can brag about. It does not have LTE connectivity and runs Windows 10 Home in S mode. That’s all the things not right with the Surface Go but what is right is that it just works. It works the best as a PC than a tablet due to lack of Google apps like YouTube on the Play Store. When I showed the Surface Go to my 4-year-old niece for the first time, her immediate question was where is YouTube. You can easily say that Surface Go is not the most ideal device for the generation that is being raised around iPad and iPhone. When given to someone older, they could make the most use of it. For instance, a friend got so good at sketching with the Surface Pen that he started contemplating the idea of using Surface Go on the move and his Wacom Cintiq at home. If your work involves even the most basic form of computing then I’m sure that you will like the Surface Go. At Rs 49,999 for the 8GB version, it is not expensive either. The only thing you need to understand is whether the S mode is right for you and if you think it isn’t then you should get the standard version immediately.